Edwin Longsden Long RA (12 July 1829 – 15 May 1891) was an English genre, history, biblical and portrait painter. Long was born in Bath, Somerset, the son of James Long, a hairdresser, (from Kelston in Somerset), and was educated at Dr. Viner's School in Bath. Adopting the profession of a painter, Long came to London and studied in the British Museum. He was subsequently a pupil in the school of James Mathews Leigh in Newman Street London, and practised first as a portrait artist painting Charles Greville, Lord Ebury and others. Long made the acquaintance of John Phillip RA, and accompanied him to Spain, where they spent much time. Long was greatly influenced by the paintings of Velasquez and other Spanish masters, and his earlier pictures, such as La Posada (1864) and Lazarilla and the blind beggar (1870), were painted under Spanish influence. 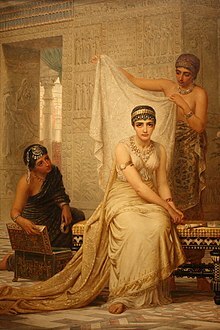 His first important pictures were The Suppliants (1872) and The Babylonian marriage market (both subsequently purchased by Thomas Holloway). In 1874, he visited Egypt and Syria, and subsequently his work took a new direction. He became thoroughly imbued with middle-eastern archaeology and painted oriental scenes including The Egyptian Feast (1877), The Gods and their makers (1878). Long was elected an associate of the Royal Academy in 1870 and an academician (RA) in 1881. His pictures always attracted attention and his Diana or Christ? (1881) greatly enhanced his reputation at the time. His pictures suited the taste and appealed to the religious sentiment of a large portion of the public, and their popularity was increased by a wide circulation of engravings. He consequently determined to exhibit his next pictures in a separate gallery of his own in Bond Street, London and there in 1883, and the following years, his Anno Domini and Zeuxis at Crotona met with great commercial success. Long died from pneumonia resulting from influenza, at his home, "Kelston" in Netherhall Gardens, Hampstead, on 15 May 1891, in his sixty-second year. He was buried in West Hampstead Cemetery. The will signed by him on the day of his death was the subject of a lawsuit, to which his relatives were parties, but the matter in dispute was amicably settled. Long married a daughter of Dr. William Aiton, by whom he left a family, of whom a son, Maurice Long, was killed in a railway accident at Burgos in Spain on 23 September 1891. Besides the Edwin Long Gallery in Old Bond Street, a number of his pictures was collected together after his death, and formed the nucleus of a gallery of Christian Art which replaced the works of Gustave Doré in the well-known gallery in New Bond Street. Long had considerable practice as a portrait painter but his success in that line was not conspicuous, although he obtained high patronage and very large prices. He painted for the Baroness Burdett Coutts (his chief patron) portraits of herself, her friend Mrs. Brown, and Henry Irving. Among other portraits of his latter years were a memorial portrait of the Earl of Iddesleigh, of which he painted a replica for the National Portrait Gallery, portraits of Cardinal Manning (perhaps his best effort in this line), Samuel Cousins, Sir Edmund Henderson and others. According to art historian Lionel Cust, "In his earlier works Long showed great power and thoroughly deserved his success and popularity", but added that his later works "suffered from a continual repetition of types which resulted in monotony". ^ (Times, 13 and 14 Dec. 1892). This article incorporates text from a publication now in the public domain: "Long, Edwin Longsden". Dictionary of National Biography. London: Smith, Elder & Co. 1885–1900. Wikimedia Commons has media related to Edwin Long.